Centennial by Sage Performing Arts. Centennial, a First World War performance from Sage Performing Arts School. A performance that touches the hearts of its audience must surely be classed as exceptional. This certainly applies to Centennial, which was recently performed in St George’s Church, Morpeth, and which moved many present to tears. Written by local scriptwriter Val Pope, it portrays the thoughts, feelings and events of the First World War and its participants both in battle and at home. Another local connection was that the performers all attend Morpeth resident Lucy Sage’s SA Performing Arts studio in Byker. Starting with the call to arms, the feelings of the volunteers and their families are superbly expressed. For many they thought the war would be over by Christmas. Sadly, for many it was and for the four years following. Letters were read, paper aeroplanes made to represent those letters and the formation of the RAF. A pyramid formed by the six young performers emphasised the rising death toll as they gave name to the major battles in the campaign. A description of a lone, young soldier dying a lingering death in ‘no man’s land’. Soldiers writing home were not able to put into words the carnage; for security purposes but also to allay the fears of loved ones at home. The cast of six had only four days to prepare for the performance. They were in a new performance area yet their choreography over the stage was immaculate, as was their timing – each member relating their part in the play. This was a tribute to their talents and those of renowned theatrical director, Katy Weir, and choreographer Gina King. “Did they beat the drum slowly did they play the fife lowly? “Did they sound the death march as they lowered you down? “Did the band play the last post and chorus ? A truly moving end to a wonderfully moving performance. It is to be hoped that although the centenary of the ending of the First World War has passed there will be other opportunities to bring this piece to a wider audience for many years to come. The message should not be allowed to fade. 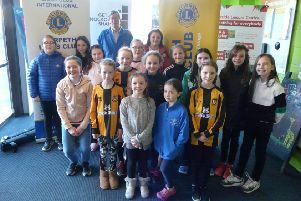 Those present did not have to pay for tickets but were invited to make a suitable donation on leaving for the benefit of the Lions Club of Morpeth, which assisted in securing the venue and with setting up the seating arrangements.